Washington, March 11.—Secretary Daniels today talked by radio telephone with Ensign Harry Sgenwater [sic] in a navy flying boat enroute from Washington to Hampton Roods. Communication was established at a distance of more than 150 miles by far the longest transmission of radio telegraph signals to an airplane In flight ever achieved. The secretary used the ordinary desk telephone on his desk. Officers in charge of development of radio signalllng were grouped around the desk. Mr. Daniels spoke of his pleasure of his making a test of the constantly improving navy apparatus and asked the Ensign how far away his machine was. After a moments delay he replied that he was then more than 150 miles from Washington and flying at a high altitude. From newspaper Ellensburg Daily Record (11 Mar 1919), 1. (source). A new epoch in aerial wireless telephone communication was established recently when Secretary Daniels, from his desk in the Navy Department at Washington maintained conversation with Ensign Faganwater, piloting a seaplane, until the latter was 150 miles distant. 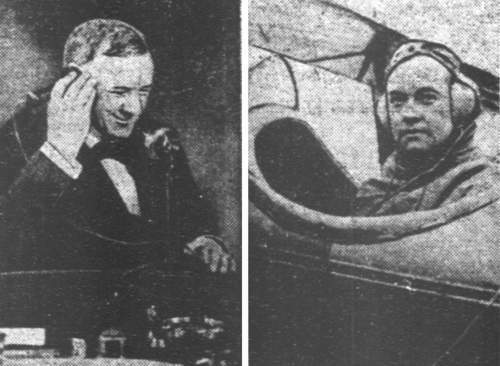 The photographs show Secretary Daniels at his desk, and Ensign Faganwater in his seaplane with his receiving apparatus strapped around his head.